Just plug it into your cigarette lighter adapter and it Cools to 39°F below outside temperature. The Ultratherm® insulation keeps contents cold. 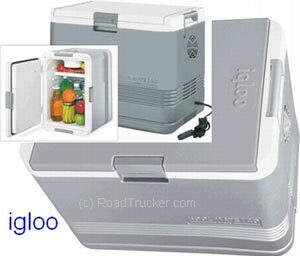 Use as a chest in the Truck or sit it vertically for use as a home, office or dorm refrigerator. Can be used with optional external 120 Volt power supply for indoor use (See Below).